Bathrooms are a highly trafficked space in every home. Not only are they needed, but they are often the permanent storage spot for a lot of life's essentials — from soap to shampoo to shaving cream. So what are the best small bathroom storage ideas that will help get the most return from what is often a very small space? Get creative and think outside the box when it comes to implementing new storage solutions for small bathrooms. Whether you live in a tiny house, apartment or an older home with less than generous closets, these clever ideas will help you maximize what you have and eliminate the trouble spots. Repurpose Storage Accessories from Other Rooms — Look at the walls in your bathroom and see if the space allows for some really narrow picture or plate shelves that could be used for makeup or toiletry bottles. Try using a magazine rack or wine rack/cube to hold your towels. While you're looking for ideas, look at options for other rooms in the house — like kitchens or offices — and see if you can't repurpose an item for your own unique bathroom storage solution. Think Portable — Bins with handles make for easy mobility so you can bring what you need into the bathroom and then put it back into another space. This is great for when guests visit or when you group things like manicure-pedicure items or cosmetics together. Don't Forget the Doors — Doors are an excellent opportunity to increase your vertical storage space. Add hooks on the back side of bathroom and cabinet doors or add an "over the door" towel or hanging device to increase your capacity. Pull-Out Drawers and Baskets — These can sometimes be added to the underside of an existing vanity cabinet, which really increase storage options. If you're thinking of a bathroom renovation, a vanity with doors and drawers is a much better choice long term than a pedestal sink if you need places to store things. The slim euro style cabinets are a good compromize between the pedestal sink and the traditional vanity cabinet, offering cabinet storage or drawer storage while taking up very little space in the room. Pull-out drawers are also an especially effective solution in the bathroom linen closet. They can function as a horizontal medicine cabinet, organizing and storing all the small bottles and personal items kept in a bathroom. Think Tiered Storage Options — Pedestal storage like a footed cake stand could hold a lot of toiletries in pretty packaging. It looks nice, allowing items to be easily accessible and stored out in the open while keeping your countertops relatively clear of clutter at the same time. Use Glass — Glass can fool the eye by maintaining an uninterupted line of vision, while providing as much storage as traditional wood shelves. Install a built in shallow cabinet recessed between the studs. This will give you three inches of depth within the cabinet to store all your bottles of eye drops, deodorant, soap, shampoo and more, without taking and space away from the room. This works best on an inside wall, as there is usually no insulation to cause problems. You can either buy a premade cabinet from your local home center, or have one built for you. If it is 18 inches wide, it will fit nicely between the studs with no cutting or framing. 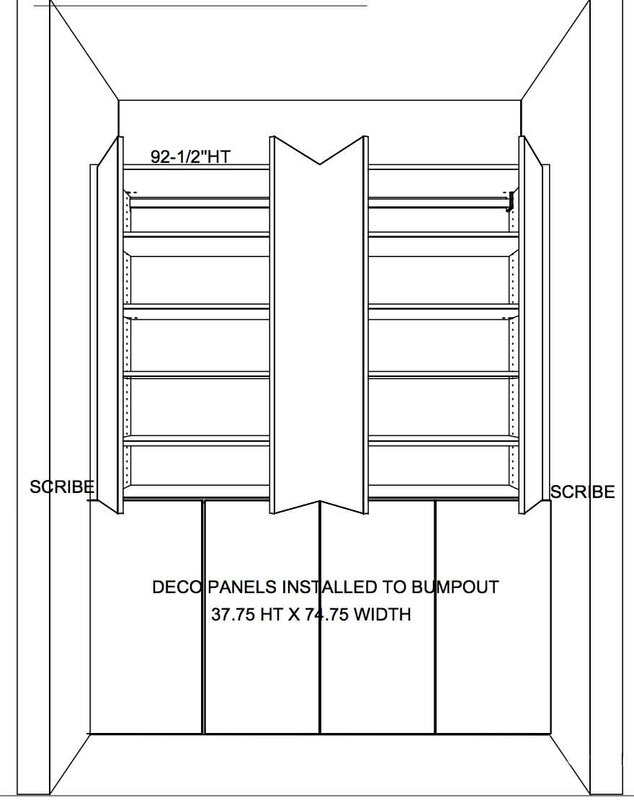 If recessing into the wall is not possible, the same concept can be applied by building a shallow cabinet up against one wall. 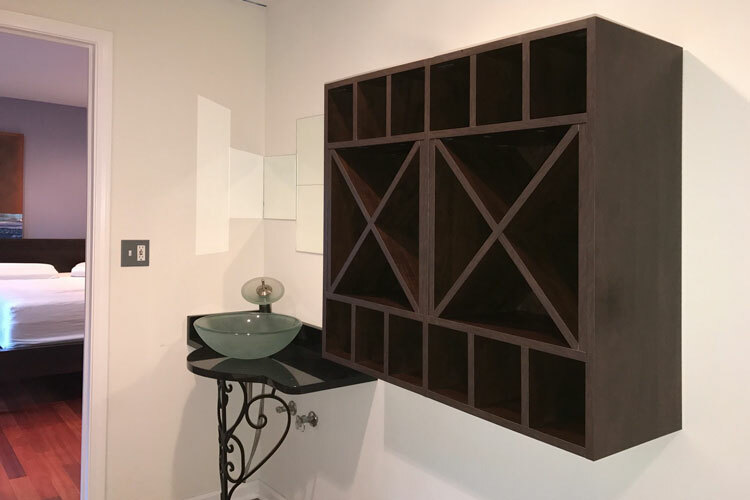 This is an especially attractive solution for those who favor minimalist design, as it provides and entire wall of storage, but can be made nearly invisible by styling the cabinet to look like a custom paneled wall. With thought, creativity and some careful planning, any size bathroom can offer a ton of storage without feeling overly cluttered. Often the more challenging spacial restraints will, by their nature, force the creation of the most innovative and unique storage solutions. Closet Works is Chicagolands' largest and most experienced provider of custom storage solutions. Since 1987, we have been helping homeowners by creating custom closets, pantries, bookcases and more to help create a better, less stessful lifestyle. Great ideas to "Organize Your Life" and examples of our custom closets ideas and other organization ideas can be found throughout our website. For more information on Closet Works call toll-free at 800-4-CLOSET (800-425-6738). Traditional wine cubes were used as an unexpected but attractive towel holder in this tiny bathroom. Towels are rolled and placed in the triangular storage areas, creating an attractive and practical display. Cubbies above and below offer an effective organization system for toiletries and small items. The small glass vessel sink is unobtrusive due to its size and transparency, but also works as a piece of art due to its sculptural quality. This minimalist design for the bathroom includes an entire wall of concealed storage. What appears to be a paneled wall is actually a hidden, built in cabinet that offers floor to ceiling shelving. 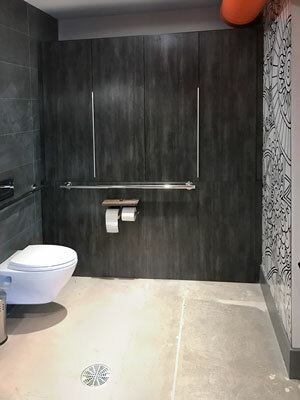 The grab bar and toilet paper rolls attach to the outside of the lower cabinet doors, further enhancing the deception that it is simply a wall rather than a uniquely designed minimalist bathroom cabinet. The drawing below shows the hidden, upper cabinets in the minimalist bathroom design fully open to reveal a multitude of shelving and storage possibilities.